Hi, my name is Michelle Hamel and I own The Neuromuscular Pain Relief Center. I have been to many health conferences and learned a lot about TA 65. It has taken me about 5 years to try this herbal compound. Here’s what I know. TA 65 increases telomerase. We actually have a gene that shuts down the production of an enzyme known as telomerase. This important enzyme helps to keep your telomeres from shortening. We all need long telomeres to protect our DNA and thus our genes. 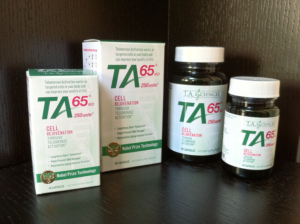 TA 65 studies indicate that this herbal concentrate regenerates telomerase within the cells. Thus, even the neurons of our brain could reap the reward! Wow, more brain power, creativity, and improved memory! Prepare to awaken the genius within. At this moment, here is what I can personally report – I am truly experiencing better recall, amazing creativity, smoother skin, deeper sleep, plus a steady flow of over all energy and well being. All within 5 weeks of starting TA 65. It’s been a great investment! In case you have not seen it, there is an impressive study on the effects of TA 65. Dr Blasco, Ph. D was able to show significant lifespan and health increase with telomere lengthening, within her mice on TA 65. Call the office today for more information and comparable pricing on TA 65. My name is Michelle Hamel. I am an advanced medical massage therapist and owner of The Neuromuscular Pain Relief Center located in the Orlando area. My practice includes therapeutic massage for disc problems, damaged joints, and nerve pain. You will experience great results within one treatment. What an amazing gift it is knowing you don’t have to rely on pain medications, nerve blocks or surgery! Serving: Orlando, Longwood, Altamonte Springs,Winter Park, Maitland,Sanford, Lake Mary, all Central Fl.